Got the supplies? The small bowl, rubbing alcohol, white coffee filter, a green leaf, and a spoon (not pictured...sorry.) Let's get started. First, tear the leaf into small pieces. Place the pieces in bowl. Use the spoon to smash the leaf, trying to squeeze as much juice from the leaf as you can. Next, put about about two spoonfuls of rubbing alcohol in with the smashed leaf juice mixture. Continue to smash and stir. Let the leaf juice/alcohol mixture set for a few minutes. When the once clear alcohol becomes a nice green color your Autumn Leaf Potion is ready for experimentation. Okay...dip a corner of the white coffee filter into your Autumn Leaf Potion. Soak up a good bit of the potion and then set the filter aside to dry. If you're like me, it is hard to wait for the potion soaked coffee filter to completely dry. Be patient, Mr. Mad Scientist. Be patient. Once that coffee filter dries, look super closely at the leaf potion stain color change. See the trace of gold at the wiggley edge of the leaf potion stain? That's what my leaf becomes in the fall....a nice yellowish gold color. Now, like I said earlier, my options for finding leaves that change into vivid fall colors are slim-to-none and yet, my experiment was successful! And my experiment was done with a whimpy little leaf. What if you did this with a big, fat, full, wonderful New England leaf? One that turns orange-red? 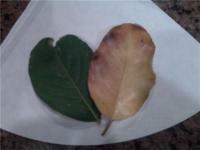 I can tell you right now...with a good leaf like that your experiment will turn out tons better than mine did. I promise. What does this experiment tell us about the changing colors of autumn leaves? Here's a good quote from a web site called Science Made Simple (great name...don't you think?) explaining what happens to make leaves change colors. The real question is....do they really change? How about that? The fall colors are inside of those leaves all along! Even when they were green. Simply amazing, don't you think? NOT a picture of my backyard. Yours? Then go out there and gather up some leaves!!!! I love this time of year, when the leaves change from a deep green color to gold or red or vivid yellow. Have you ever wondered how this happens, how leaves change color? Tomorrow why don't we do a simple little experiment to see how this phenomena takes place. The supplies you will need will be a small bowl, a spoon, a white coffee filter, rubbing alcohol, and a green leaf. Now, where I live in Round Rock, Texas there are 'slim-pickins' for big, broad leaves that change into vivid colors. (I live in a new housing development where the trees in our yards are similar to the one Charlie Brown chose for his Christmas tree...skinny.) If you can find some nice maple leaves or Bradford Pear leaves that'd be good. If you can't that's okay. We'll make it work. Gather up some leaves and I'll see you tomorrow!